The Sri Lankan Government delegation which attended the United Nations Human Rights Council (UNHRC) session in Geneva last week had a crucial meeting with the High Commissioner for Human Rights Michelle Bachalet. Secretary to the Ministry of Foreign Affairs Ravinatha Ariyasinghe told The Sunday Morning that the meeting was fruitful but refused to reveal further details. However The Sunday Morning learnt the Sri Lankan delegation informed the High Commissioner of the implications that may arise if Sri Lanka were to implement all the recommendations listed in her report on Sri Lanka. The Sri Lankan delegation assured that more progress would be made during the two-year extension given to Sri Lanka through the Resolution which was passed last week. 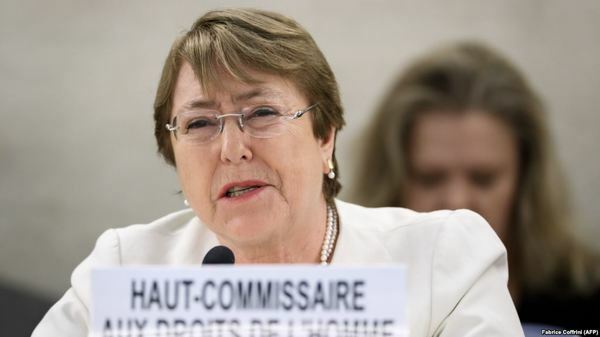 The High Commissioner proposed in her report, the setting up a fully-fledged Office of the High Commissioner for Human Rights (OHCHR) in Sri Lanka. However, the Sri Lankan delegation led by Foreign Minister Tilak Marapana reiterated that Sri Lanka cannot agree to that proposal. Matters pertaining to the implementation of the Resolution on Sri Lanka which was passed by the UNHRC last week were also discussed. Sri Lanka had also urged the High Commissioner to visit Sri Lanka at the earliest possible date to see for herself the peaceful environment in the country. The High Commissioner had said during the UNHRC session that despite progress on some issues, there has been minimal progress on accountability, including on setting up a special judicial mechanism to deal with the worst crimes committed during the 2009 conflict. She also noted the continuing impunity risks fuelling communal or inter-ethnic violence and instability. She called for the establishment of an independent Truth and Reconciliation Commission and a vetting process to remove officers with questionable human rights records, and noted slow progress in replacing the problematic Prevention of Terrorism Act (PTA). She encouraged the Government to implement a detailed and comprehensive plan for the transitional process with a fixed timeline. Environmental groups claimed that the country had lost around 10,000 acres of its forest cover due to the Moragahakanda and Kalu Ganga Development Projects. Former President Mahinda Rajapaksa is to take office as the leader of the opposition by the first week of January 2019, the Sri Lanka Freedom Party claimed.